Earlier this year, Austin emo masters Mineral announced plans to reunite. Of course, with renewed interest in the band, it only makes sense that they'd have some music to sell, so they've announced plans to reissue their two albums. The group's 1996 album The Power of Failing and its 1998 follow-up EndSerenading have been remastered and linked together for a new, double-disc compilation. The release includes everything recorded by the band between 1994 and 1998. Naturally, it's called 1994 -1998: The Complete Collection. In addition to the two LPs, the release will include bonus songs and previously unreleased alternate recordings. The compilation will be available on CD and vinyl, and will arrive on October 21 via Arena Rock Recording Co. in North America and a day earlier overseas via Xtra Mile. The release is similar to a Japanese compilation called The Complete Collection that came out in 2010. 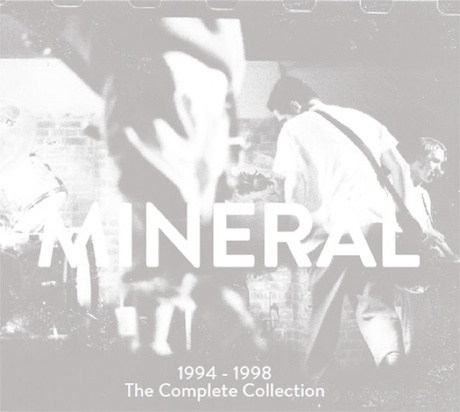 Speaking of overseas, Mineral have added a batch of European dates to their reunion tour. Sadly, however, they still haven't bothered with any Canadian shows. All we get is a teaser video for the tour. Check out the tracklisting for Mineral's upcoming anthology, along with their upcoming tour dates, below. * with Into It. Over It. Mineral Share Second New Song in 20 Years "Your Body Is the World"